The demonstration comes nearly a month after journalist Gauri Lankesh was killed outside her home in Bengaluru, sparking protests across the country. Journalists assembled at the Press Club of India in Delhi to protest against attacks on press freedom. New Delhi: Journalists gathered at the Press Club of India in New Delhi today to protest the recent spate of violence against mediapersons. Reporters and editors from across media channels and newspapers demanded a status report on all pending cases from Home Minister Rajnath Singh. "This is not a token effort, this is just the first step," said senior journalist Rajdeep Sardesai. "In the name of the Mahatma, this violence has to stop; both physical and mental." Similar protests were staged in over 20 state capitals around the country, by the state Press Clubs. 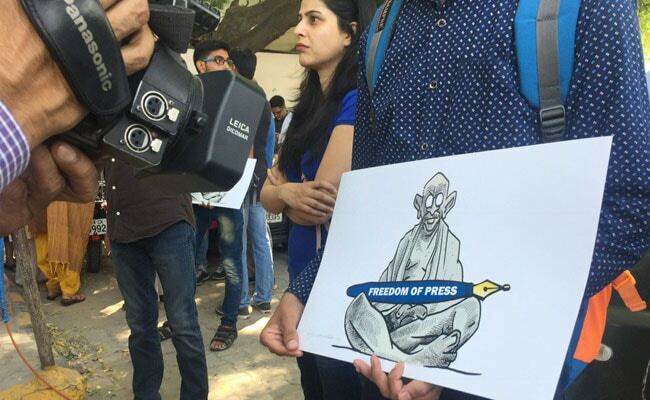 Members of the media held hands to form a human chain and walked around the Press Club of India, holding signs that read "Protect press freedom, Save democracy!" and "Trolling journalists is intimidation; not an exercise of freedom of expression but an attack on it!" 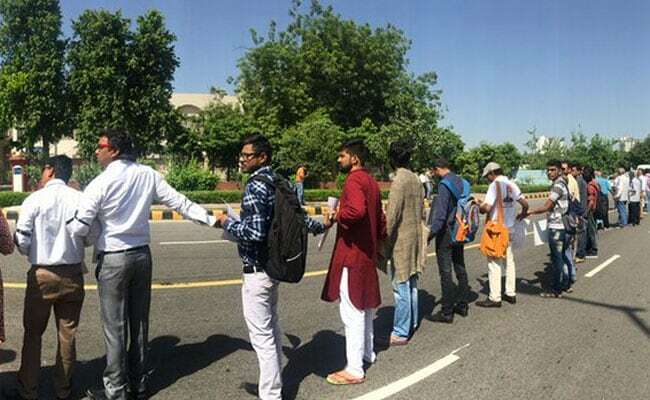 Journalists held hands to form a human chain and walked around the Press Club of India. Journalists then signed a memorandum addressed to the Home Ministry, demanding to know the status of all pending cases of violence against the media. Press Clubs from across the country will come together to submit the memorandum on October 5 in New Delhi. State Press Clubs will be submitting similar memorandums to their state governments. The demonstration comes nearly a month after journalist Gauri Lankesh was killed outside her home in Bengaluru, sparking protests across the country. A fortnight later, reporter Shantanu Bhowmick was abducted and killed in Tripura. While arrests have been made in Mr Bhowmick's murder case, Ms Lankesh's attackers are still on the run. Since then, several reporters across Delhi-NCR have complained of receiving anonymous threats of violence over WhatsApp. The messages state that anyone critical of the Narendra Modi government or the RSS will "meet the same fate" as Ms Lankesh. India is one of 13 countries that feature on the Global Impunity Index, a list of countries where the killers of journalists go free, compiled by the international non-profit organization Committee to Protect Journalists. According to another international non-profit, Reporters Without Borders, India ranks 136 out of 180 countries in this year's World Press Freedom Index.